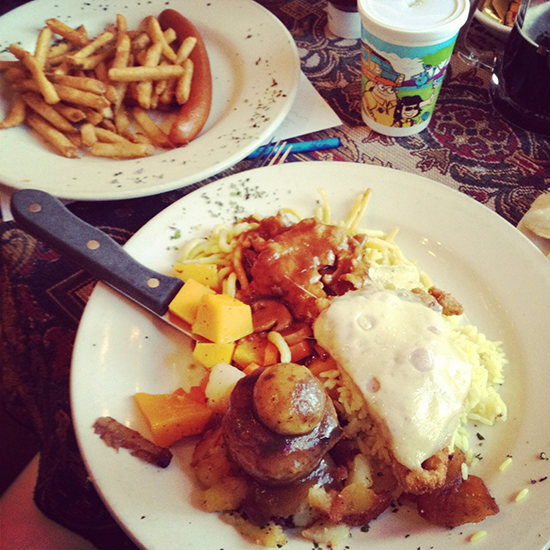 Edelweiss is everything an authentic German restaurant should be. There’s traditional costumes, accordion playing entertainment, deer heads and cuckoo clocks lining the walls, pitchers of crisp dark Dunkle, black forest torte, and huge, heaping plates of heavy meats and potatoes. It’s been the spot for brat in my hometown of Colorado Springs since before I was born and after a family friendly dinner last night, I can tell you it’s still the same. And that’s a good thing! While there are no doubt tons of great unknown gems to find in this week’s blog pick, Berlin Beatet Bestes, Kamera Song by Rosemarie Heinikel (aka Rosy Rosy) and the band The Inner Space (no affiliation with Dennis Quaid) that eventually became the revered Krautrock band, Can caught my eye and ear instantly. Made for a film called Agilok and Blubbo, of which I found precious little info about except for a few lines here, the album seems to have gained more cult acclaim recently as marking the beginnings of Can. 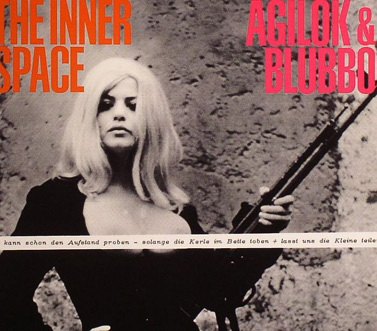 The song is a bit Nico, a bit Giallo, a bit progrock, and wholly enjoyable. 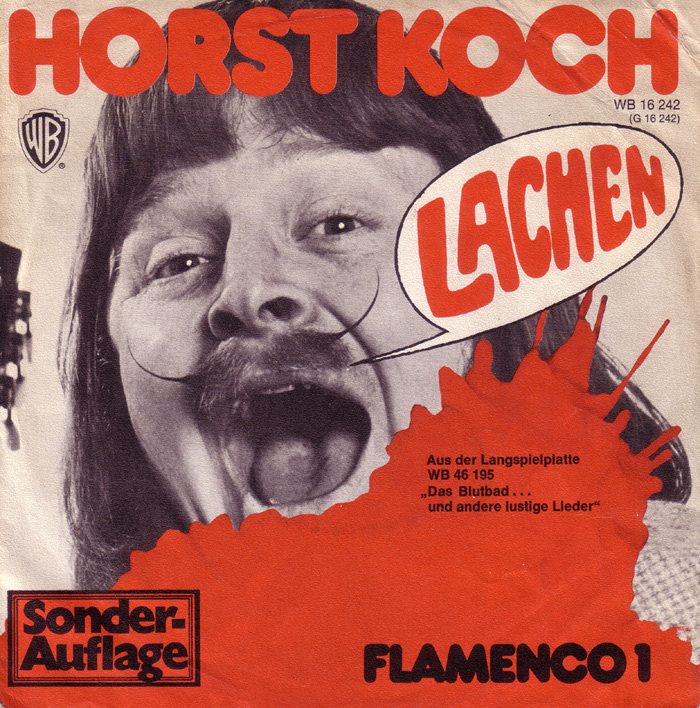 I have the quite interesting site, Berlin Beatet Bestes to thank for this week’s song, but there’s much more the in pages of this German based collection of odd records. There are high res images of albums you’re very unlikely to see anyplace else as well as information about the artists and illustrator when blogger Andreas is able to find it. He also made a visit to our very own neighborhood record/junk shop The Thing! I’ve posted just a handful of personal favorites below/after the jump, but the extensive archives are worth browsing yourself. A great random find during a google image search. 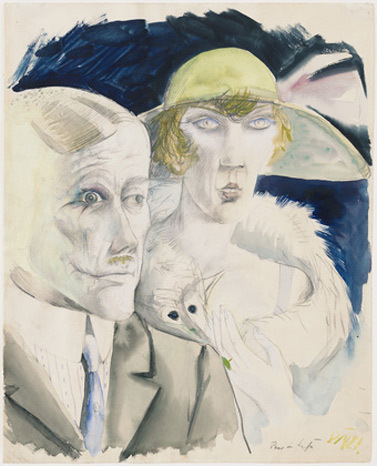 The Otto Dix show at the Neue Galerie is “the first solo museum exhibition of works by this major German artist ever held in North America” and it’s thrilling, disturbing, and inspiring to see, so make sure you stop by before August 30 when it comes down. 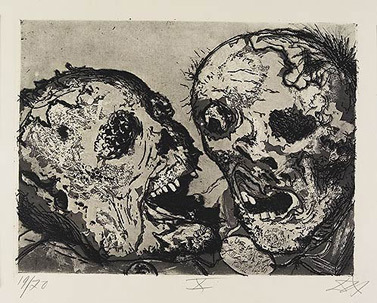 A fascinating artist dealing with absurd and the realistic, Dix art, with wit and amazing imagery, covers both the horrors of World War I and the decadence of the Weimar culture. 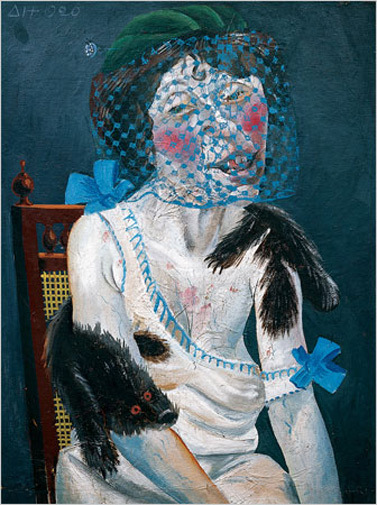 Both of it’s time and timeless, the paintings and etchings called to mind not only the writings of Christopher Isherwood, but more modern wits like Anthony Burgess, Charles Burns, Kurt Vonnegut and Francis Bacon as well as my favorite spot in the Met: the Flemish portraits. The large colorful portraits are stunning, particularly his iconic glowing red study of Anita Berber, complete with razor sharp manicure, but the smaller etchings have equal impact. A great show by an artist many would be wise to become aware of if the name’s unfamiliar. Its smoky flavor is being achieved by exposing the malt to the intense, aromatic smoke of burning beech-wood logs at the Schlenkerla-maltings. After mixing it with premium-class hops in the brew, it matures in 700 year old cellars, deep down in the hills of Bamberg, into a mellow, magnificent-tasting beer, best drunk directly in “Schlenkerla”. There is far more to Schlenkerla than delicious food and drink. If you would rather drink you beer by yourself, be forewarned: it is almost impossible to avoid relaxed, cheerful conversations at the wooden tables. In everyday life the ordinary Franconian acts somewhat reserved when dealing with strangers, but that characteristic is left outside when entering the Smokebeer paradise. And that is a tradition. For centuries the tasty, dark brown brew has made our guests happy and loosened their tongues. As in the past, when high clerics sat at the same table with farmers, today the musician from the Bamberg Symphonic Orchestra drinks his beer next to the factory worker. Original Schlenkerla Smokebeer levels the differences between classes. It brings together the stranger with the local. As you’ll soon read on this week’s website pick, Bier Hall Crawl, my dear friend Mike has taken on the challenge of eating in every German beer hall in the five boroughs. This little endeavor means all sorts of schnitzel and pretzels for me! We began with a reservation at the seventy four year old Yorkville stalwart, Heidelberg, where the beer flows freely (and sometimes in giant glass boots) and the staff dons traditional costumes. 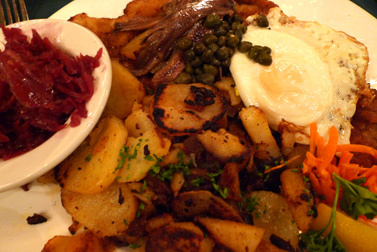 The menu is full of traditional dishes including Schnitzel a la Holstein – which my favorite way to take a schnitzel: with a fried egg, anchovies, and capers. It was the most impressive looking dish of the night (as you can see from the photo) and it was delicious despite the egg being far too set for my taste. I got try a less familiar German favorite (and one that my friend Astrid enjoyed as a kid with her Oompah in Austria), Liver Dumpling Soup, a belly warming treat that I doubt can be found in many restaurants today. The dumplings are essentially like a matzo ball, but with veal. Friends enjoyed bratwurst, meatballs in mustard sauce, and fluffy giant potato pancakes. How we managed dessert is almost beyond me, but I really wouldn’t pass on the refreshing Rote Gruetze, a raspberry, cherry, strawberry compote with vanilla sauce. If you are extra lucky, Werner will play you a tune or two on his polka-ready accordion. Great place for a group. Take a base of traditional folk, add one part Jethro Tull, a generous drop of Nico, a splash of Amon Duul II, and a garnish with Peter and the Wolf, and you’ll end up with Holderlin’s Traum, a musical concoction perfect for a handcrafted clay goblet. It’s a beautiful and gentle first album by the German band that has recently made a sort of comeback with a new album. 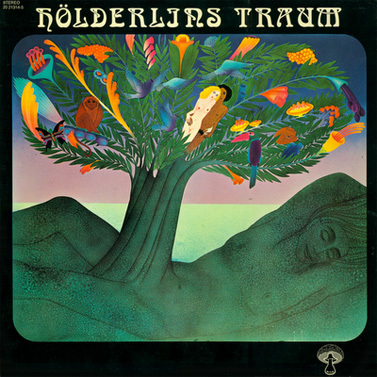 This early seventies effort is as appealing and ethereal as the album art and title (Traum translates “dream”) and worth a listen for anyone with a soft spot for folk, krautrock, lilting female voices, and the flute. The songs will stay in your mind, even as you hum along to the unknown lyrics (well, unless you speak German of course). I am surprised this band has not been as rediscovered as others of the genre, but with recent accessibility (amost of their albums are now available on iTunes) I think that might change. Like several former Brix Picks, I might soon hear it playing over some brunch in Brooklyn. 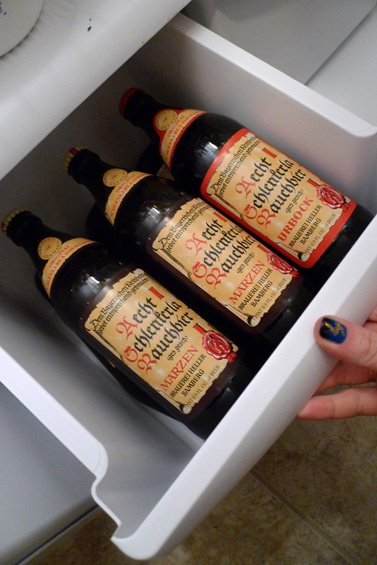 It's Oktoberfest Party time again, and it's always tons of fun to host your own. 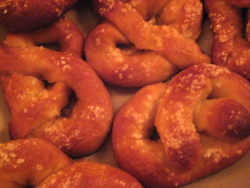 We took over the honors this year, and I feared that meant none of Mike's yummy home-made pretzels – but our good friend Johnny came to the rescue with an amazing dough recipe that yielded in superbly soft results. We also had great luck at Marlow and Daughters (as always), scoring with a button of soft cow's milk that was a crowd favorite as well as a wonderfully tasty selection of sausages. Throw a little party game madness in the mix and lots (maybe too much for some of us) beer and you've got a great night on your hands. Bitter Tears of Petra Von Kant was my introduction to Rainer Werner Fassbinder, and it was an introduction long time coming. I've always been intrigued by the covers in video stores of beautiful pained women and the titles like Beware of a Holy Whore and Ali: Fear Eats the Soul. Still, I hesitated for years to watch one of his films, but once most were available to me on netflix on demand, I no longer had any excuse. I've learned that the controversial director with a complex personal life (check out the drama on his wikipedia profile) has a certain style of directing which equals twenty five minute scenes of people talking. It may sound trying, but because the characters are talking about the gossip of their lives as their relationships rise and fall apart, and the acting is so superb, the visuals so stunning – it's riveting. Fashion wise, the film is beyond incredibly inspiring. See a collection of stills here and long for theatrical wigs and makeup, intricate dense beading, and wild necklines. Petra's apartment bedroom/workspace too,?in which the entire film takes place will haunt your aesthetic dreams. A fully covered floor with white bear skin? I've certainly heard worse ideas. Even if the setting is stunning, the limited scope gives a claustrophobic portrait of a manic woman locked in her own mind and world with little interaction with reality. It's hard to interpret who you are meant to have sympathy for, if anyone at all. Even Marlene (played by Irm Hermann, once Fassbinder's lover and victim of abuse), the movie's most beaten down and enigmatic (especially when we learn she's been packing heat the whole time) is not wanting for your pity. It's a slow and challenging movie if you're not in the right frame of mind but it's a rewarding and haunting experience. My curiosity to see more of his prolific career has been piqued. It's rare to absolutely adore a meat shopping experience, but Schaller and Weber, a classic German market that has stood on 2nd Avenue since 1937, is such a friendly old world kind of place with such kindly service that you leave with a warm feeling in your heart and a smile on your face. Along with that warm feeling, I took home some extra spicy mustard, great bottled chornicons, a marzipan piglet, and a phenomenal few bright red hot dogs. Later snuggled in French bread along with that spicy mustard, these were some of the best dogs we've ever enjoyed. What we didn't leave with was one of the cute classic steins in the windows. 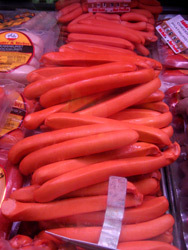 Another visit will be necessary for me to pick one up, and i'll probably take a couple more of those hot dogs too. 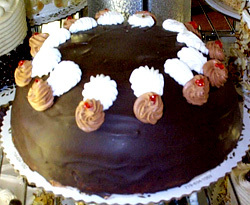 I was so lucky to grow up with such an amazing german pastry shop in my home town. We had the cake pictured for Jim's birthday.